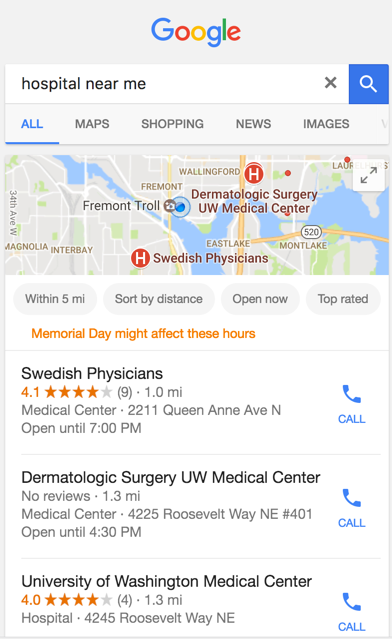 The Discovery and Direct search type data provided in Location Insights proves an excellent source for identifying the local search queries you’ll need to optimize for to improve engagement with your business on local SERPs. For those unfamiliar with Discovery and Direct search types, here’s how it breaks down. Direct searches are branded and performed by those “customers who find your listing searching for your business name or address.” The local results for a direct query are likely to be a single map listing or a knowledge panel listing of that local business. Searches in this category are executed by those potential customers further along on their journey to your local business, in that they have already decided to seek out your brand. 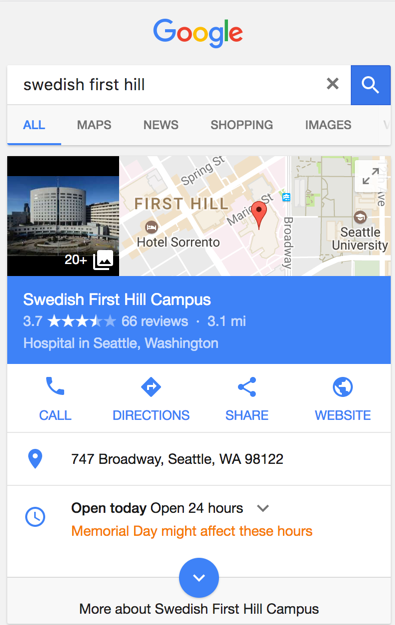 The branded query “swedish first hill” in the example below, illustrates the kind of result a direct search is likely to return on Google. Discovery searches, on the other hand, are non-branded. They are those queries in which the searchers obvious intent is to seek out a service or product without any brand pre-requisite. Many discovery search queries follow the cadence of “[service] + [location]”, such as “endocrinologist seattle” or “hotels in Portland”. Discovery seems an appropriate description of these keyword phrases as searchers using them are in the “discovery” phase of their search journey. Discovery search results are most likely to be in the form of a map pack. As illustrated in the image below, the query “hospital near me” returns three local options in the map pack that may satisfy the searchers need. Google describes Discovery searches as those searches performed by “customers who find your listing searching for a category, product, or service”, who’ve most likely come across your listing in the map pack. Discovery searches offer a unique opportunity to improve brand recognition for any business willing to put in the work to rank for them. 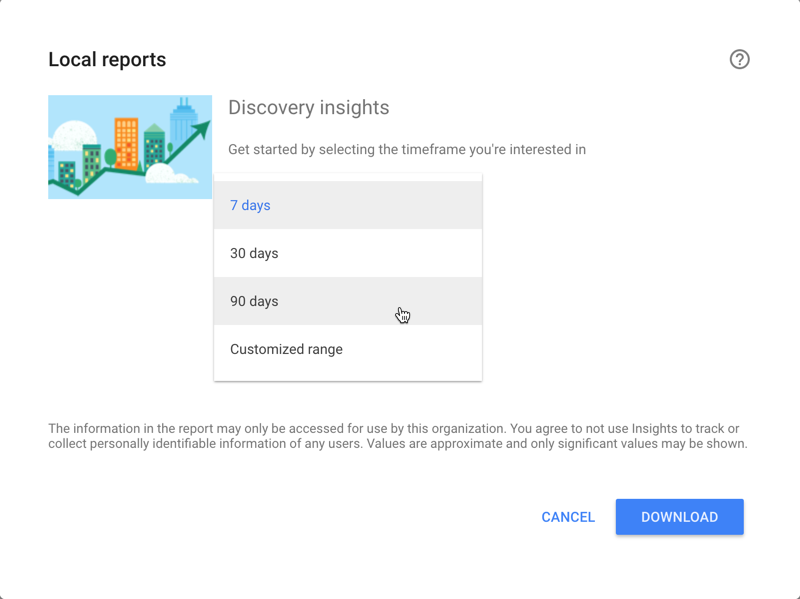 You can find your Direct and Discovery search data in your Google My Business dashboard and download reports for the past week, month, last 90 days, or a custom date range — as far back as 18mos. The report downloads as a .csv file. In the spreadsheet, you’re provided with Total searches, Direct searches, and Discovery searches over that period along with several other useful data sets that we won’t dive into here. With these straightforward metrics, you’ll be able to tell quickly where your local strategy is under performing. Many businesses will have a well-established brand, so it’s common to see Direct searches accounting for 60% or more of the total. However, if you’re exceeding 70% or more, your local listing is likely not as visible as it should be for competitive Discovery keywords in your market and/or region. This means, some people may be finding your business information in Google when they already know what they’re searching for (e.g. your brand’s nearest location), but are not discovering your business when they are searching more generically, for a product or service you (and your competitors!) offer. With the Google My Business data loaded in Excel, it’s easy to drop it right next to your impression, position, and click-through data from Google Search Console. From there you can organize your Insights and Search Console data to highlight those specific keywords your site is receiving impressions for that qualify as discovery searches. Although most keyword detail is hidden from you as “not provided” in analytics, it’s still available in Search Console data, making this a rich source of insight for your local search strategy. Organize your data to determine if those discovery searches compare in volume to your impressions for local long tail keywords. You can then whittle away at the data to find out which discovery searches you’re missing out on. First, make sure you’re pulling data from Search Console and Insights for the exact same time period. Filter out all your branded keywords using the “does not contain” filter. Drop your brand name and any common variations from your data. You can do this in both Search Console and Excel but we find it easier to download all the data and organize in Excel. You should now have a shorter list of only discovery search queries. Next, filter impressions in descending order (there’s a good reason for this but more on it later) and total them at the end of the list. How do the numbers compare? Is it safe to assume that these queries are the same as some of the discovery searches Google is providing in Location Insights? You now have a list of queries sorted from most impressions to least. To get a better idea of where to start your local optimizing, filter your position data to exclude anything over 20 and under 5 (it’s likely that anything in the top 5 organic listings is already contributing to the discovery searches in Insights), which will limit your list to keywords within striking distance. Take those keywords and do a quick site search to see which page on your site is currently Google’s favorite. If you haven’t invested much time in location landing pages, chances are that these will be product and service pages, maybe even a blog post. If you’re not already over-optimized for the phrases on the resulting pages, this is a good opportunity to add instances of the long tail keywords and build relevant links to these pages. The goal is to increase the “importance” of this page, from an SEO perspective, in the hopes of getting Google to rank it higher than other pages in relevant search results. We’ve seen huge successes with shifting our keyword focus to location landing pages. It might be a strategy that will benefit you as well. You just might move the dial and increase the amount of discovery searches leading to engagement with your business online. As one might expect, there is a substantial amount of overlap of ranking factors for results in the organic and local listing spaces. The most successful local strategy moving forward will be one that utilizes Discovery and Direct search data to inform both on-site and local listing optimization.